I saw these carved boards by the front of my neighborhood temple, so I stop by in the mornings to check on their progress. I wondered when the craftsmen had been working on them. On Saturday, I found them, so talked with them for a while as they worked. Each of the windows takes about a week, though since the men work during the day and it's usually dark when they get off work, they mostly work on the weekends. 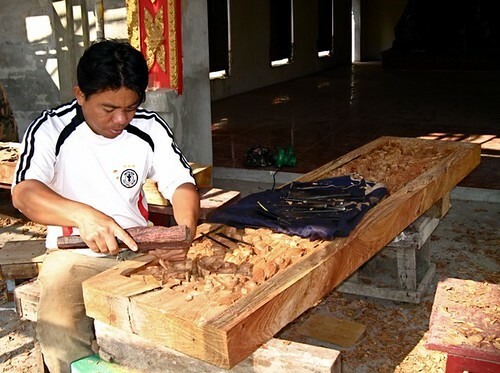 They are donating their services to the temple, though the planks of rose wood (Mai duu in Lao) had to be bought. 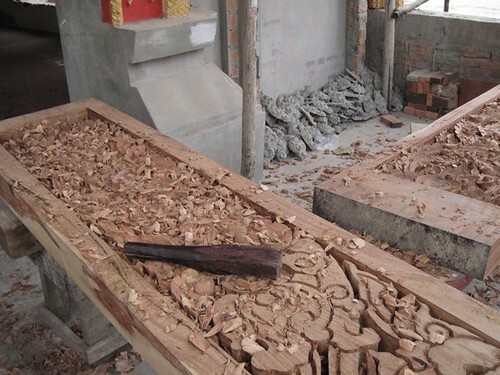 Rose wood is a hard, dense wood which everyone likes to use for furniture, mostly exported. 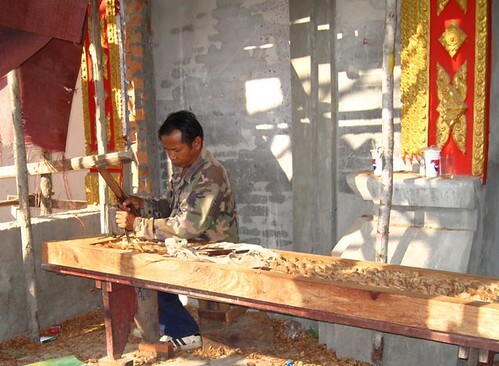 Many trees have been cut and sent to Vietnam. This means that the cost has risen - so these boards are very expensive. The other workman. Note the Pepsi cups behind him. 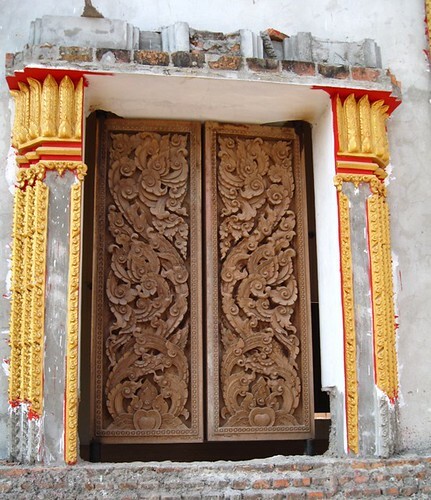 Wat Meuang Wa is one of the oldest Buddhist communities in the city. When I first moved here, there was an old community hall made of teak and two temple buildings and one dormitory for the monks. About five years ago, they tore down the wood building because it was falling apart, and put up a cement building which is mostly a dormitory and offices now. And two years ago, they tored down the Bodt, the building which houses the Buddha images. 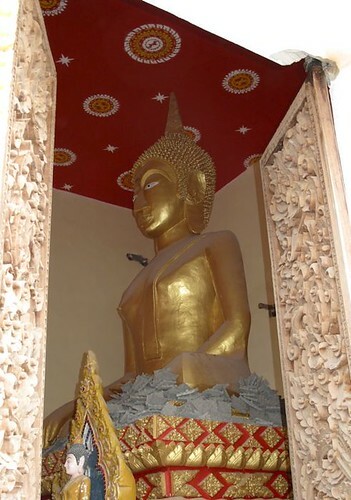 Interestingly enough, they did not move the larger Buddhas during the construction, but built a room around them. They have taken down the planks and have started to paint the detail work both inside and outside the building, even though the building structure itself is nowhere near completion. I am always fascinated by the fabulous works of art that come out of the Asian influence. Such ancient beauty, masterfully driven by a simple people and the love of their religion...beautiful doors sheltering Buddha. Wow, that wood carving is magnificent! Wow, those wood carvings are magnificent. Such patience for the men working on this.